Investigating a crime scene and evidence & retelling of the story in PE. Picnic photos from the Old Bear topic launch. This week is ‘British Science Week’. The Hedgehogs class have been learning about Charles Macintosh and his invention of waterproof material. They have carried out some research about Macintosh and written a fact file for him. 14.03.18 Today the children have had a session of 60 second science challenges in the hall. They first had to imagine how long 60 seconds was, walk around the hall and then sit down when they thought they had been walking for 60 seconds. Then the children were able to walk again to the timer to see how long a minute actually lasts. The next challenge was ‘can you stand on one leg for 60 seconds?’ It was interesting to see which children had the balancing skills and ability to focus and not get distracted. The final challenge was a group activity to build a marble run using the materials provided in 60 seconds. They had to think about what would be the best materials to use for a marble run and how it was going to be set up to try and get the longest rolling marble. Each group’s marble was timed rolling down their run and then recorded by a child on a whiteboard. The winning group’s marble rolled for 30.14 seconds. We then had a discussion about what factors affected the other two group’s marble runs and how they could have been improved. These included thinking about the space the marble had to roll after coming down the run and the height of which the marble run started. The children really enjoyed the Science fun! On Thursday afternoon in Science the children began to learn about how and why Meteorologists measure the weather. This afternoon the children made their own Rain Gauge in a group and then went in the outdoor area to position it ready. They are going to measure the rainfall every day at the same time for a week and record their results. All the children made a prediction on the total rainfall for the week. Hedgehog’s class are very excited to see how much it rains. On the other hand, Miss Calvert was hoping for more sunshine! This afternoon in Science, Hedgehogs have carried out their first ever enquiry. Last week the children planned their growth enquiry to investigate the question: ‘Do children get faster as they grow older?’ This week they were able to make a prediction, carry out the enquiry using the equipment they needed and used children from Years 2, 3 & 4 to complete the activities. At the end of the lesson the children had time to reflect and discuss what they had learned and what their results showed. Miss Calvert was really impressed with the children’s attitude, behaviour and effort during their enquiry this afternoon. Well done Hedgehogs! Some of the Year 1 children have read a book called ‘How to Make a Bird Feeder’ this week in reading sessions. This inspired this week’s activity in the messy area. The children have made their own bird feeders. Just look at the wonderful ways that Miss Calvert's Hedgehogs are using different items to consolidate their knowledge of multiplication. They had the 'times' of their lives! Y1/2 photographs. Just look at the beautiful role play area that the children have access to as they embark on their Katie Morag topic. The Isle of Struay comes to Nafferton! 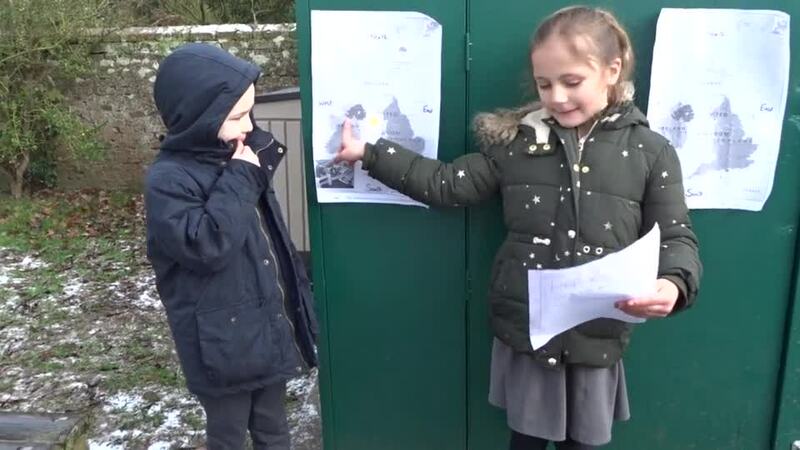 Hedgehogs re-tell the story of The Three Little Pigs outdoors. Thursday 12th October 2017 The children worked in groups to act out the story, thinking about the different characters and using the familiar language in the traditional tale. The children used their imagination to turn the willow tunnel, trees and areas of the outdoors into the three little pig’s houses. The children all had the opportunity to perform to each other. They were also able to watch their own performance back inside the classroom on the interactive whiteboard. Year 1 have spent PE lessons with Mrs Kitchen. They have been exploring the story of Jack and the Beanstalk, developing their ideas and turning it into a dance. They have looked at key movements in the story such as climbing the beanstalk, striding and skipping. The children have thoroughly enjoyed this topic. Year 1 had a wonderful (and wet) trip to Burton Agnes Hall where they learnt about the history of the Hall and explored the trees and plants in the garden.